The temple is located near Swaamimalai, maintained by the Ahobila Mutt. The Moolavar is Aandalakumaiyan seen in bujanga sayanam posture facing East. 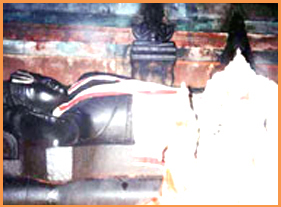 There are the idols of Thirumangaialwar & Kaamadenu at the feet of the Lord. Direction and Posture Bhujanga Shayanam and East-faced. Features The Rajagopuram of the temple was commissioned and built by the 44th Jeer of Sri Ahobila Mutt. Access to the temple The kshetra is about three-fourths a mile from Pullamboothamgudi. AanduAlakkumAyyan (Aandallukumayan). Moolavar in Kidantha Kolam bujanga sayanam facing east direction. Prathyaksham for Thirumangai Alwar and Kamadhenu, the Cow. It is located at 6kms from Swami Malai, 1 km from Thirupullamboodhangui & 2 kms from Thiruvaikavur. The buses from Swami Malai to Thiruvaigavur will stop here. The buses are very rare. No much facilities available here. Stay either at Kumbakonam or Swami Malai and visit this temple.